The stitch-a-longs (SAL/s) I will be talking about today are cross stitch ones, but many of the points I make here are related to all SALs such as quilting ones like Coffee Rings and Making Things runs. How long does a stitch-a-long last? Some people run them for months/a full year. For example, Caterpillar Cross Stitch has one that has just started (Seas The Day) and its running for 9 months; until September 2020. Or there is Tiny Modernist who has also just started one (Words to Live By) and that is running for a full year; until January 2020. The reason cross stitch might appeal to you is that you can work on one project for a long time, so a long SAL like this would be perfect for you. I’m the opposite though, and I love to actually finish a project quickly. I love that feeling of satisfaction you get once it’s done, and I can be pretty impatient. So my SALs are short and sweet; usually between 6-8 weeks (My newest SAL is my Hello Spring one). 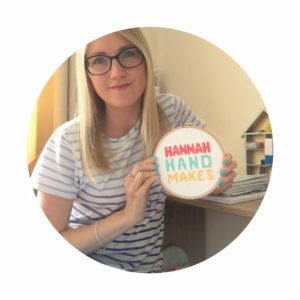 If you have just started your cross stitch adventure or you don’t have much time to cross stitch (working mum of 2 over here 🙋‍♀️), then this kind of SAL might be better for you. How does a stitch-a-long work? But I would recommend checking if the pattern has any complicated stitches in before you start. You might also be slightly overwhelmed by a lager design if it is a long one, but SALs are always broken down into chunks so hopefully this will reduce those feelings. I actually think a SAL is a great place for a beginner to be because you can talk to others about the exact pattern you are stitching and get any help you might need. This isn’t always possible when buying a kit or stitching a pattern you found on Pinterest. This is the whole reason I started running SALs; so I could bring together a community of cross stitchers who all like stitching similar things. My community has grown vastly to include all kinds of stitchers now, but this has only made the experience even better. Even if you don’t want to join one of my SALs I highly recommend joining my Facebook group if you are looking for a supportive and encouraging cross stitch community. Like I said a but further up, a SAL is a great place to learn to cross stitch. 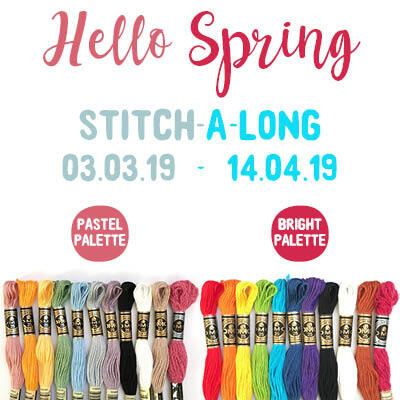 My Hello Spring SAL is perfect for beginners because it only has whole cross stitches and a small amount of easy back stitching. It’s only running for 6 weeks so it is a manageable size and I even give you the choice of 2 colour palettes! If you are someone who feels guilty for never finishing a project then a SAL is great because it gives you a time frame for stitching, and seeing everyone else’s progress on it will give you the motivation to get yours done. FYI – I never feel guilty for leaving a project unfinished and you shouldn’t either (if you’re not loving it then why stitch it? ), but I know some of you hate to leave things unfinished and a SAL can help keep you accountable. If you are someone who loves surprises and cross stitch then you were made to take part in a SAL. It’s so exciting waiting for the next part of the pattern to be released and trying to guess what will be next. There are so many patterns out there in the digital world that it can be hard to decide what project to stitch next. A SAL kind of takes that decision away. You don’t need to decide if you love the pattern before hand or when you will stitch it – the person running it does all that for you! I hope I have convinced you to join a SAL! Or maybe I’ve convinced you that they’re not for you and that’s OK too. Like I said before, we shouldn’t be stitching something that we don’t love.